Drive! Magazine covers all the action, from nostalgia racing, classic car restoration, to hi-tech street rodding, right on through the 70′s era muscle cars, and today’s sport trucks and dressed-out SUV’s. 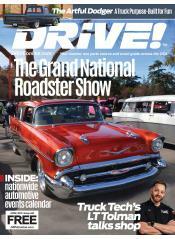 If you can drive it, you can read about it in the pages of Drive! Magazine.